A viewer asked how to make a big, billowy hood like the one Tauriel wears from the Hobbit movies! Here is what I came up with – different from my red riding hood pattern this will give you a big piece to pull down over your face. The perfect Middle Earth accessory! Row 1: hdc in 3rd ch from hook all the way down, 3 hdc in last turning ch and work around to hdc down the opp side of your ch. ch 2 & turn. Notes: Place a stitch marker in your top stitch if you have difficulty placing it. For the remaining rounds we will continue this increase, placing 3 hdc in our top chain, until we reach the desired shape of our hood. Ch 2 counts as your first st & first dc st should be place in 2nd st. Note: At a certain point in your work, it is important to stop increasing as there will be a large number of stitches and your hood will begin to look too floppy. Keeping yarn attached to your work, add 2 hdc to last st and hdc along the bottom of your hood placing 1 hdc stitch for each row of your hood. Pattern Notes: There are lots of different ways you can complete your hood. You can attach it to any crochet project or crochet a cowl/bottom piece. Ch the necessary amount of length that holds your hood open how you want it [I chained 12] and sl st it to the other side of your hood. Pattern Notes: If you would like a small neck piece then crochet a few more rounds placing 1 hdc in the front loop only. If you would like your pieces to continue to drape over your shoulders continue on with pattern. Pattern Notes: If you would like to continue your piece even further to your shoulders like a cape then work another round of increase (Round 2) and then rep round 3 for desired length. There are lots of different variations to finish this hood. Be sure to adjust this pattern to fit with your materials and needed measurements. sl st to join. Fasten in your ends. See how I made the hood in the video tutorial below! I am really satisfied with the look of this hood! It has been snowing/slushing a lot here in Maryland and this hood is really great to protect you from the weather… I wear this indoors as well though. I definitely feel like an elf or a ranger when I wear it! As I mentioned my hood is created for the character Tauriel from the Hobbit movies. However, there are lots of other characters who wear hoods that this hood could imitate like Merida from Brave! Of course this hood would look great on its own in any color or added to any projects that is in need of a big, billowy hood. Be sure to send/tag me in pictures on your social media if you make this project or any others! Posted in Crochet Patterns, Video TutorialsBookmark the permalink. Is there some way you can make this into a knitting pattern? I am not familiar with crocheting, just knitting. I LOVE this look! Big Hobbit fan here! I am so sorry for the confusion. I realize this step is confusing but the fix is actually quite simple. After row 14 you will continue working back and forth in rows as you were before, however, you are no longer increasing in the top stitch. After row 14 you should have enough stitches that placing 1 stitch in each stitch will get you a hood shape. You can test this out buy trying on your hood and making sure it comes up and over the back of your head. I hope this makes sense, it would have been much simpler if I explained it properly in the video and again my apologies! 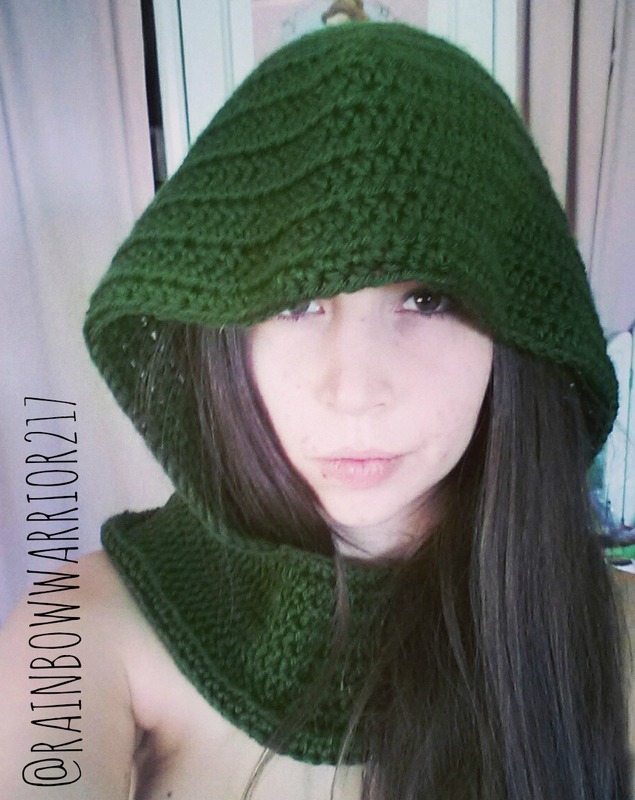 Hey Rainbow Warrior, I saw your tutorial and I decide to make one of these hoods for my wife. It’s a little bit bigger then the one in your video and I used two different yarns at once, it looks awesome. Anyway, I am try to add “depth”, maybe not the right word, so the the hood covers more of my wife’s face. Do I keep adding rows until I get the depth I want? Also, I haven’t been keeping count of the rows that I have, not to sure where I should start counting. Any who, I wanted to run an idea by you: do you think it would be possible to add a “point” to the front of the hood by crocheting across the front of the hood and decreasing with each successive row? Hit me up with an email when you get the chance, I’d love to hear from you. Of all your creation I was attracted to try the “elf” pattern. I like it very much BUT what I want more is your generosity in sharing your patterns. Other crocheter are so secretive with their pattern although they do video demo. They should realize that not everyone can crochet or knit without pattern. Thank you for not being stingy with your work. I love this and would love to make it for my daughter who is 4 years old. How many chains would I need to put at the beginning in order to make it fit her? Is the first chain of 25 supposed to measure 14 inches (the hood length)? Hi, i got another silly question – what you call Row 1 in this piece means going back and forth both sides of the work? So the 14 rows are actually 28, one side with the increase and the return without? When you say 14 rows of increases, is a row going back and forth? So it’s actually 28 single rows?